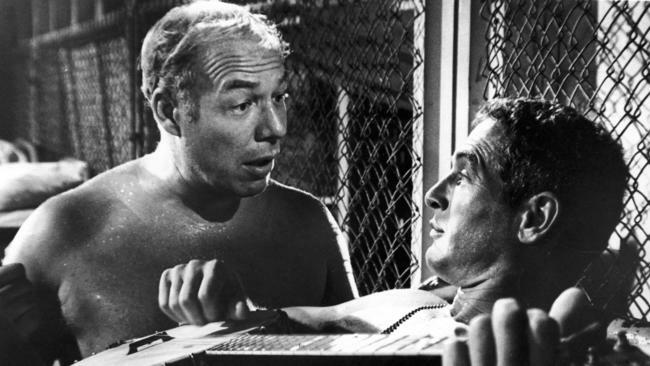 I see George Kennedy died, another big–6’3″–lummox of a Mick with kraut mixed in. He signed up for the infantry in the War, just a kid, and wound up an officer and spent sixteen years in uniform. I remember a zillion years ago him telling some interviewer, Larry King I think, about how the Army gave him his start in show biz. Seems the Pentagon assigned him to the Phil Silvers Show as official US Army advisor. The Army wanted Sergeant Bilko done just right. I don’t think George advised anybody anything, but he watched and learned. He was never a great actor–he himself said that–but he was a good actor, and he knew how to laugh a big laugh on cue and he sure could charm an audience. I even think people, deep down, identified with him more than Paul Newman in Cool Hand Luke. He almost lived forever, George Kennedy did, to ninety one, and he made who knows how many movies. You never switched off the television because it was George Kennedy. And he played everything and anything, a real journeyman, good at no matter what it was the director wanted. They don’t even call them emergencies anymore, he said as George Petroni in some ridiculous Airport movie, they call them Petroni’s. That’s the only line I remember from that movie, and he’s the only cast member I can name. There’s some big guys you never forget, and once gone, you’ll always remember. This entry was posted in Movies and tagged Cool Hand Luke, George Kennedy, George Petroni. Bookmark the permalink. Fantastic, and thanks thanks thanks for writing it. Your hymn is sized to fit the man just right. I’d no idea he was advisor to Bilko. Good G*d. When I was a kid, Kennedy meant dark movie theater magic. He WAS the movies. I really really personally appreciate your piece. The Airport line I remember, and it likely informed my adult terror of flying, is “…explosive decompression at 30,000 feet is something you gotta see to believe.” I mean, just the horror/romance of the term ‘explosive decompression’. Thanks, Brick, for the doing the cultural housekeeping no other writer does with such loving thoroughness. I just dashed this off on Facebook without too much thought, and when it got a big reaction I was surprised as hell. You8 can never tell what is going to hot home, and what will echo unheard. Anyway, glad ya dug it and thanks as always….